This is an example of just how we can get selective invoice finance fast for a client - we can ensure a fast turnaround for you if you need help quickly. In this particular case we were contacted by a car repair body shop that was looking for a selective invoice finance facility. They contacted us on a Sunday, we introduced one of our funding partners, that specialises in car body repair shops, on the Monday morning. The financier paid out, against a batch of invoices, the following day - Tuesday. So we achieved a 3 day turnaround between initial contact and cash being paid to our client - ideal if you need to raise some cash quickly and haven't got time to wait. 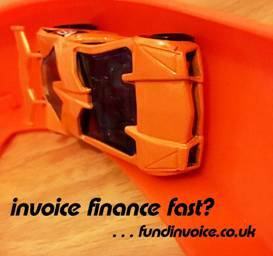 The truth is, FundInvoice is our business, we the partners deal with our clients personally. Therefore, prospective clients can call, or email us, at the weekend, bank holidays, whenever and we will respond. The main number below goes through to our mobiles if it isn't answered immediately. Even if we can't answer the phone at that moment, leave us a voicemail and it is automatically emailed to our mobiles, so we can come back to you. If you use the quote request forms on our site, again we will automatically get an email. We both have our phones with us 24/7 so you will get a quick response. We both know how aggravating it can be to have to wait days for someone to respond to you when you need help and reassurance asap. We have had several instances where we have won deals, that also contacted our competitors, as we provided an immediate response. In this case it was a Sunday morning when our client needed help. Two days later the client had been sent funds by one of our funding partners. If you need a quick response please call Sean on: 03330 113622.